What a gorgeous bag! Lucky you! 1. I have so much love for those printed pants. 2. Brandy Melville! I always hear Lorraine mentioning that brand in her vlogs. 3. The bag. I have no words for how beautiful it is. Swoon! Thank you :) And yes to Lorraine and Brandy Melville - it makes me so intrigued to find out more about the brand and I was pretty excited to see that this was one of their pieces...haha sad! Dayum that Focco is a beauty! 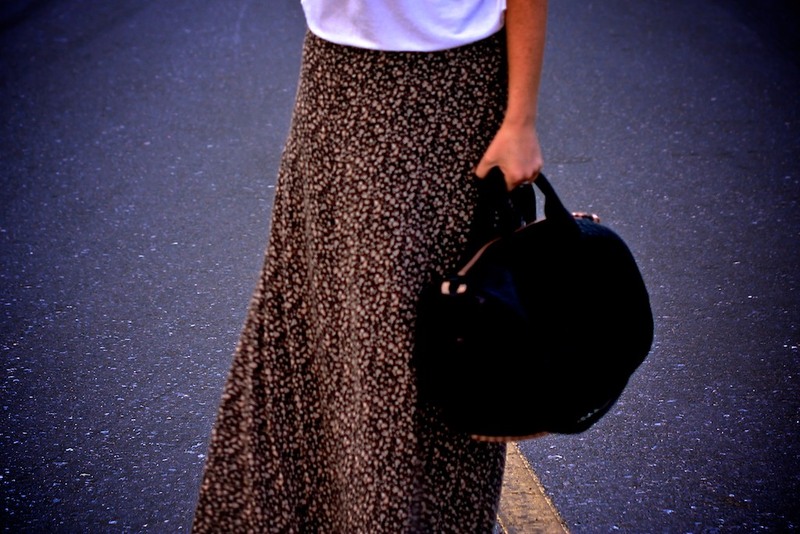 love the skirt, i really wanna find a maxi skirt that i like! perfect! would love to see the OOTD! I was wondering how the trousers fit? Should I get my usual size or do they run bigger (as most joggers do) so I should rather size down? Ahh, the bags ace, love the rose gold studs. I like the combination of the converse with the maxi but somehow I never feel like it works on me. Don't know why. Actually converse or even just converse style shoes just don't look great on me. 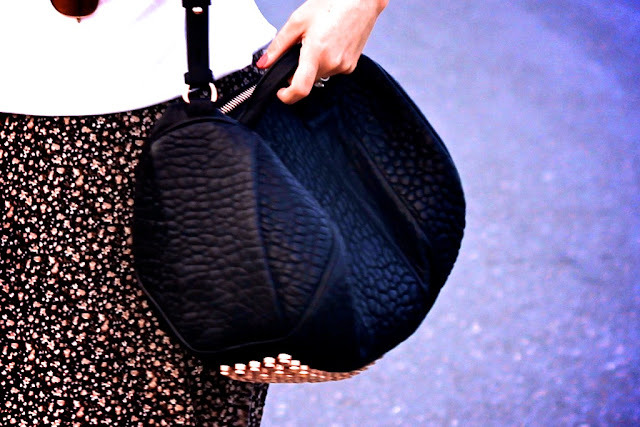 Such a beautiful bag :) Happy weekend! yay! I love them so much - enjoy your hols! It's a dab of Tom Ford Black Orchid - I need to do a blogpost on it. Such an amazing lipstick! I'm adoring the rose gold hardware on your shiny new bag Laura! Love the maxi paired with the chucks also. Thank you so much - have a great weekend too! daring match... i always pair my maxi dresses/skirts with sandals. somehow the converse adds a bit of playfulness and daringness to the combo... love it!! Wore the skirt with sandals yesterday and it felt right :) I like it both ways :) Thanks Rachel! You look so chic and beautiful, thanks for sharing Laura! Cool! I love your style! Laura, are your Louboutins 120mm or 100mm? I've been wanting to order some but not being able to see them in person I'm not sure which to get!! I can totally see you in them - needs to be done! :) PS. Jealous of your daughter's Burberry! such a pretty look! i love the converse and skirt together! Love the maxi with the converse - very laid back California vibe :) and obvi the Rocco looks GORGEOUS! Those feather trousers are amazing! and I need some converse! Serious bag envy going on over here :P I don't think I have ever seen maxi skirts worn with converse. What rock I have been living under I do not know, but I like it! 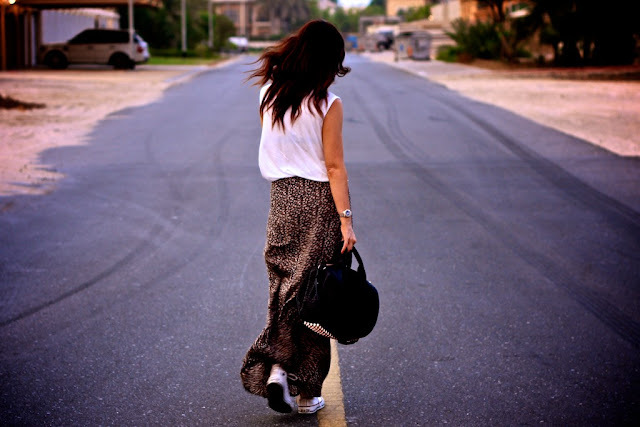 i love maxi skirt/dress and converse! that skirt takes me back to first year uni 1993.
don't ever lose the exclamation mark in Link! I love this outfit, it looks great and the print is lovely. I've gone for a long skirt and hi tops to create the same vibe! Love this look and in particular your hair is looking fab atm! Love this bag...it was so nice that you received it for your birthday, enjoy! Wow, what an amazing birthday present! And love your outfit! These pants looked nice with sandals, but they were made for simple black heels!! Amazing outfits! I love the whole outfit, such a pretty skirt and oh my life the bag is a beaut!! I absolutely adore your effortless style! The Pedigreed Chic of the Converse/skirt ensemble is very early-Carly-Simon-pretty! Great Look! Laura do you recall the name of the lavender-pink lipstick you wore in your "Back to Brown" post last Sunday Aug. 12? I have been on the hunt and -despite many tempting overtures- remain on the prowl. The color was haplessly fetching and perfection on you! PS Oh my goodness, the sole reason for my non purchase of this bag was because I couldn't carry it!! but it looks so amazing on! love the pants and bag!! Love those Louboutins Laura! Wish I would have gone for those instead of the giant platform one's I have... much more wearable and chic (to use the cliched terms of the century.) Love the Converse too... you pull it off well. I'm afraid I may look too hipsterish and my friends will turn against me. On you though, perf!! I love the bag and the skirt, the outfits look so chic. I looked into the belt sizing mystery - apparently xs is "unavailable" and I wonder if it exists? I might get it to belt a coat with. Otherwise after you recommendation of the l'oreal lovely rose (rouge caresse) it is now my honeymoon lipstick (squeal!). THANKS!! You look so beautiful, thanks for sharing this post! You may select the highlighted cards. It will ease your selection treatment. Citi Card Login the Individual ID and Password that you created previously.